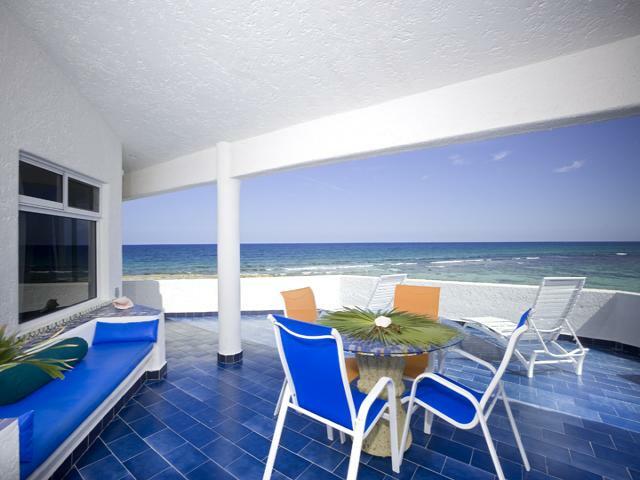 Enjoy a piece of Paradise with a picture-perfect view. 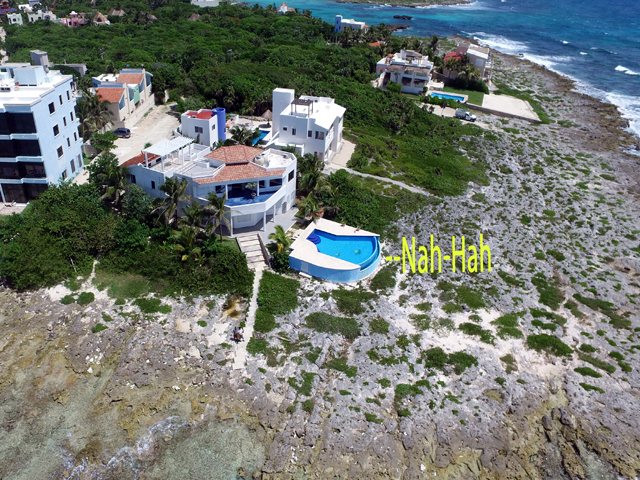 Nah Hah is truly a "one of a kind" villa with more ocean frontage than any other villa in the Akumal area. 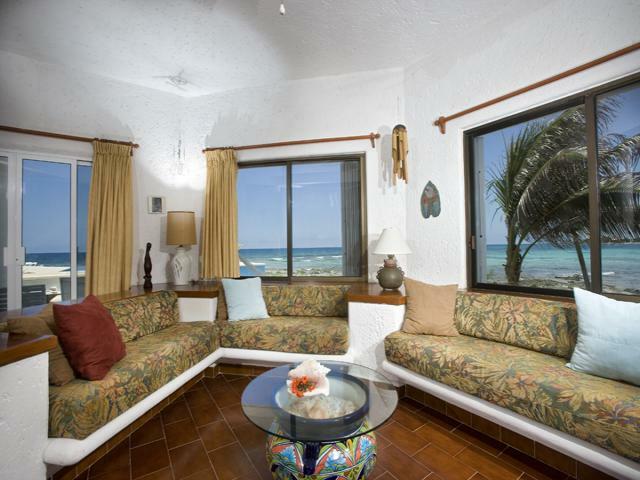 The views are breathtaking and the ocean can be seen from every room in the villa. 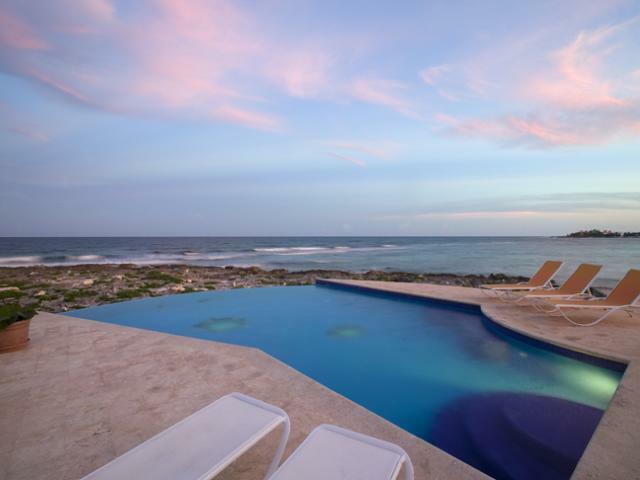 The "infinity edge" swimming pool looks as though the water is falling right into the ocean and swimming in it is a real treat! 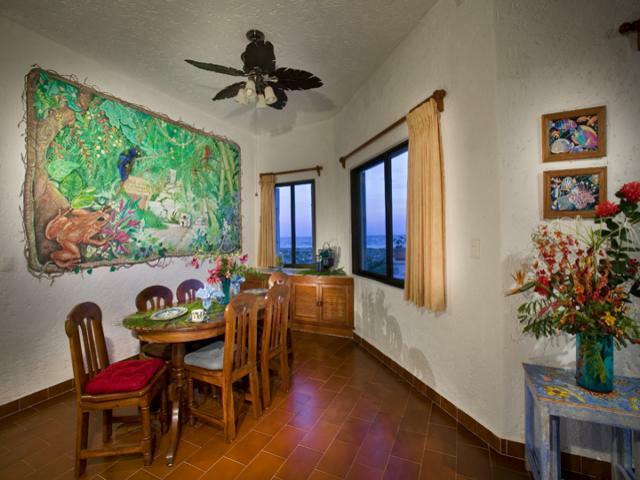 The villa is very private and spacious, perfect for a group or a family reunion! 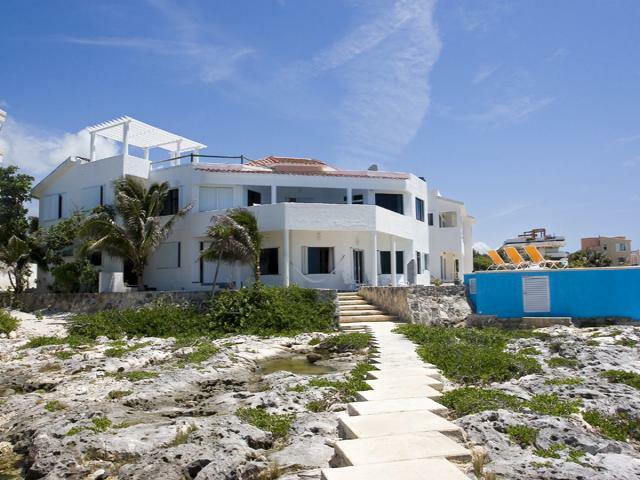 Villa Nah-Hah is 20 mins to Tulum, 15 minutes from Puerto Aventuras and 30 mins to Playa del Carmen, by car! 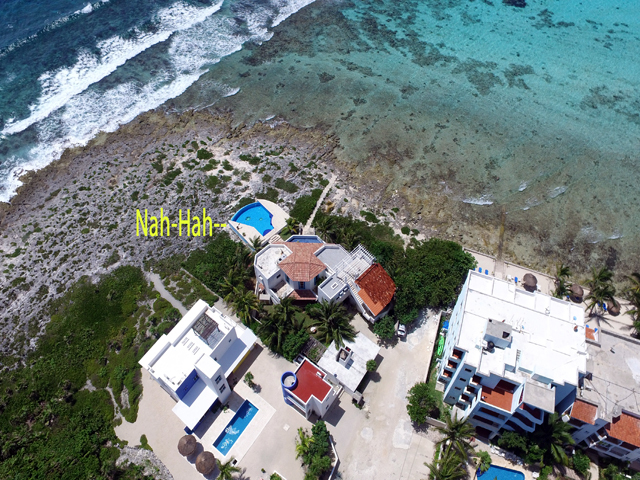 Nah Hah has over 4,000 square feet of living space with four air conditioned bedrooms, each with private bathrooms. 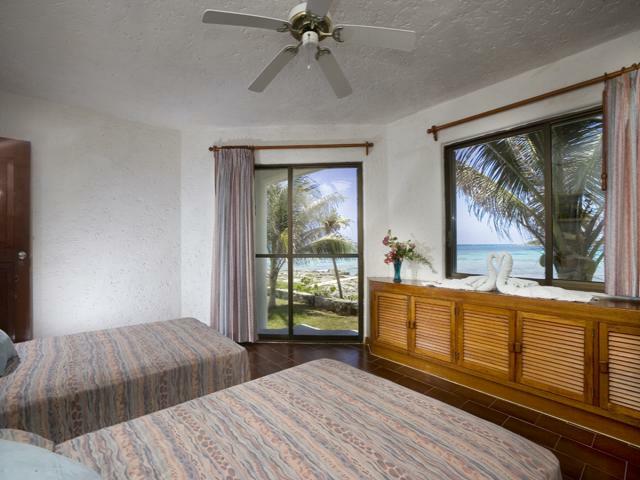 Each of these bedrooms has an incredible view of the water so where ever you sleep, you'll wake up with the beautiful Caribbean in sight! 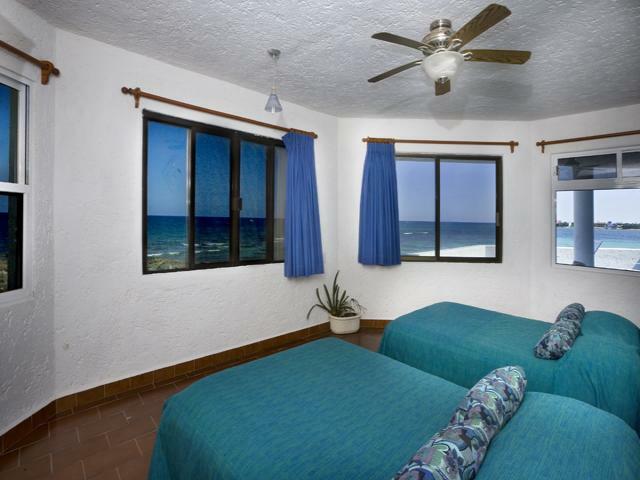 The master bedroom has a wonderful open terrace which overlooks the pool and sea. Set up a hammock and watch the days go by! 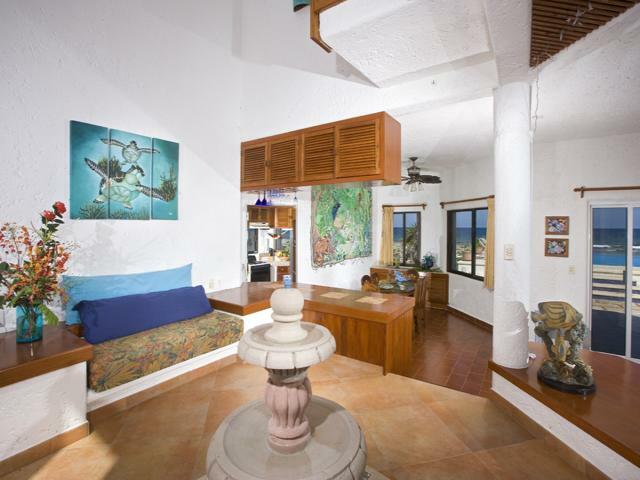 Nah Hah features a large circular living room with lots of comfortable seating, a dining room with a beautiful wall mural, fully equipped kitchen, gorgeous entryway with a fountain and huge outdoor balconies both upstairs and down. There is lots of space so each guest can enjoy their privacy and a wonderful entertainment area in the living room with a stereo and CD player as well as a satellite TV with DVD player. There is also wireless high speed "Hot Spot", so you can stay as "connected" as you want to be. 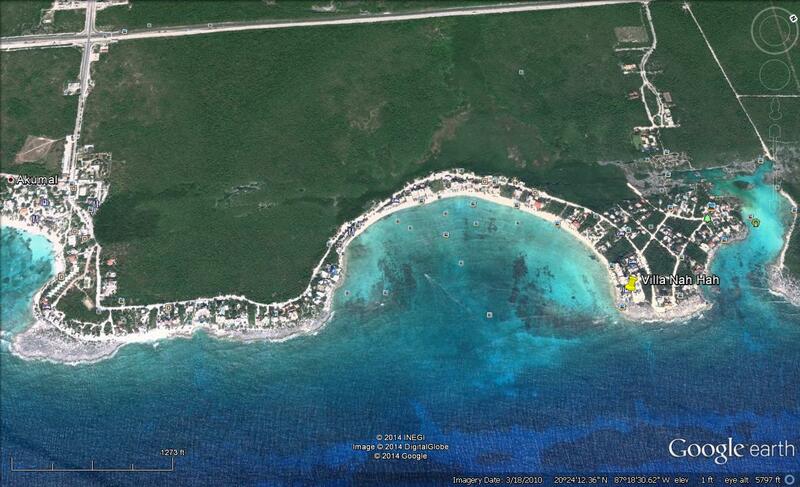 If you like to snorkel, Nah Hah's location is perfect! 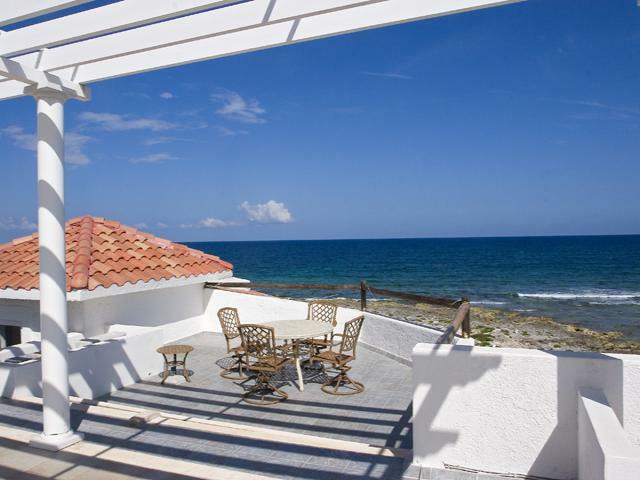 You can walk right out into the ocean by the swimming pool and find some of the best snorkeling on the Caribbean coast. 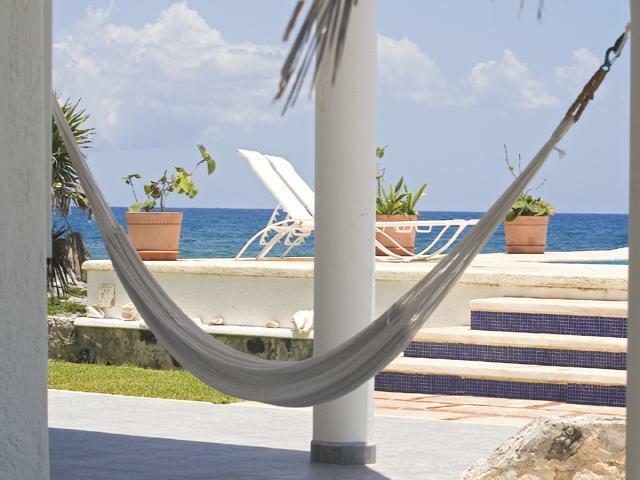 If you would rather just relax, there are hammocks swaying on the balconies and outdoor built-in couches as well as lounge chairs, pure heaven for enjoying an icy cool drink. 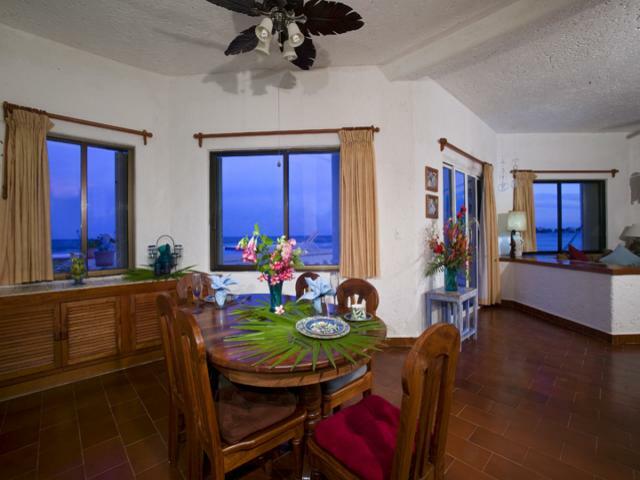 Nah Hah's caretakers live on the property and can be hired to cook breakfast and dinner. Go on, why not spoil yourself! 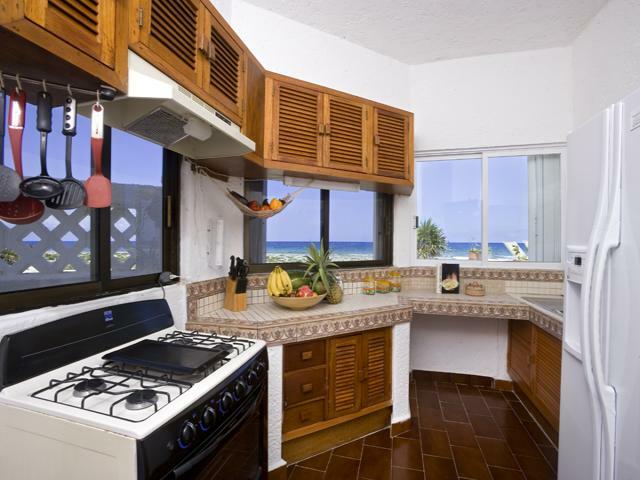 You can also choose from Akumal's fabulous local restaurants, which all feature delicious regional food and, of course, lots of seafood! 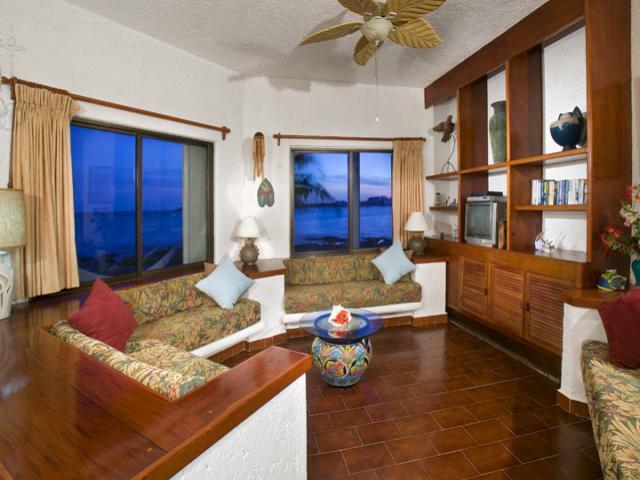 You'll never regret choosing Nah Hah for your vacation, it's fabulous! Upstair guest Bedroom â�� 1 double 1 queen size. Ground level exterior Bedroom â�� 1 king size. We recently returned from a week’s stay -- we LOVE Nah Hah! 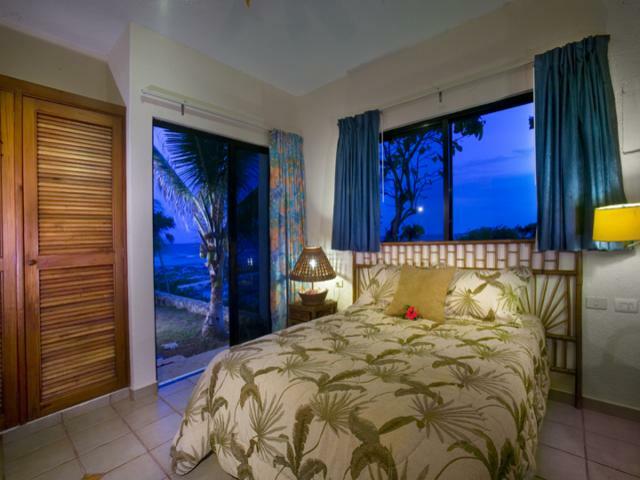 We were a group of friends – 8 adults -- 2 couples and 4 singles, and the bedroom arrangements suited us perfectly. 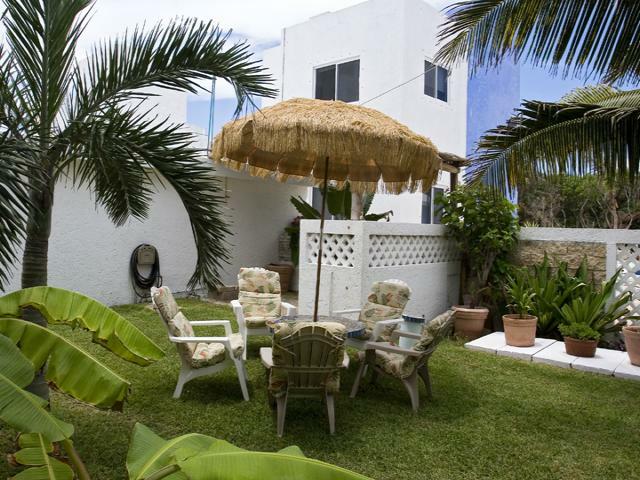 The house is beautiful with plenty of space, the location and views are exquisite; there is a sense of privacy (the way the house is situated you really feel like you’re all alone), the resident iguanas and other critters/birds are fun to watch, there is excellent access to Half Moon Bay for snorkeling, and amazing sunrise and sunset views from the various decks and (yes, fabulous!) pool. Storage: every bedroom has hanging and shelf space for clothing and personal belongings, some more than others but all seemed adequate. I shared the upstairs 2-bed bedroom – not only did we have lots of shelves in the bedroom, we had an additional walk-in closet with shelving that we used to stow our emptied suitcases. This closet also houses one of the safes. Bathrooms: Each bedroom has a full bathroom; the bathrooms vary between having standard tub/shower units and full tiled showers. My bedroom had one of the full-tiled showers and I loved it. Our shower had a dispenser with soap/shampoo/conditioner and I believe others did as well. I never utilized them because I’m particular about such things, but one of our party mentioned that she’d tried the soap and was not terribly impressed by the quality. Still really appreciate that it was provided, however. Three of the bathrooms are “en-suite”; the downstairs 2-bed bedroom’s bathroom is technically just outside of the bedroom and off the foyer, making it convenient for anyone to use during the day. The 2 members of our group who shared that bedroom said that it was no problem for them. 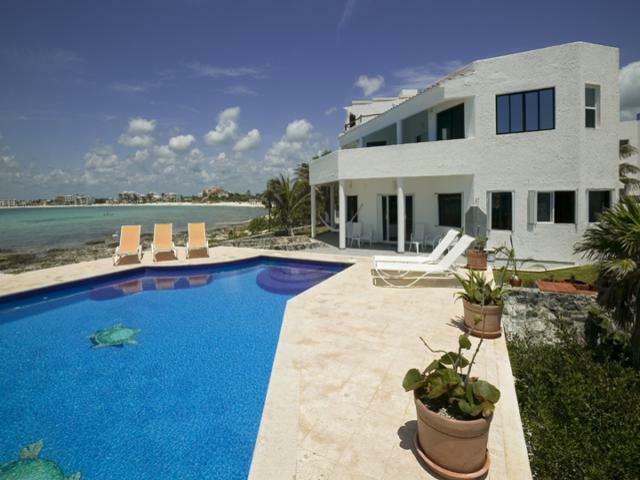 Snorkeling access: most of our group’s primary interest was snorkeling and this house delivers, in spades. The walkway access into Half Moon Bay is perfect. Yes, it’s iron-shore and you must be careful and water shoes are highly recommended (the house has a selection available for use if you forget yours – explore the drawers in the foyer), but the water entry was WAY better than what I experienced in 3 previous years’ stay at Playa Caribe condos. No ding on Playa Caribe – we totally loved that place too – but Nah Hah’s location at the northern edge of HMB made for less wave-battling on marginally windy days to get to good snorkeling. We were also lucky to have an added perq: Nah Hah has a “sister” villa (same owner) on Yal-Ku which, since it wasn’t occupied the week we were there, gave us free and easy access. It was such a treat to be able to run over there – an easy walk – in the afternoon when the vanloads of day-trippers had left and do a quick snorkel in the lagoon. Outdoor shower: Yup, there’s a good outdoor shower. Perfect for rinsing off our gear and ourselves after snorkeling. WiFi: The Wifi was pretty darned good – overall better than anything I’ve experienced in 10 years of traveling to the area. There were occasional temporary outages which I would attribute to widespread system issues rather than problems with the house set-up. If I really needed to get online and the wireless wasn’t available, I would revert to using my phone as a hotspot and never had a problem with that – good cell reception for Verizon, at least (know your international data plan – this could be a costly alternative if you’re not set up for it). Supplies & Kitchen: The appliances pictured have been replaced – there’s a new stove unit and a new French door refrigerator with ice-maker – both worked well. The ice maker uses bottled water so no worries there. Additional bottled water is provided in the kitchen, as well as a (filled) pitcher and plastic glasses in each bathroom. Microwave, toaster oven, blender and coffeemaker worked great – we ran out of coffee filters, so stock up on those when shopping (it’s a standard drip coffeemaker) – and there is a teakettle for boiling water on the stove for tea. There is a selection of herbs and spices available, although we didn’t do any serious cooking so didn’t explore too closely. Plenty of glassware and crockery, as well as plastic glasses/plates for outdoor/poolside use. Huge walk-in pantry for storing groceries, and a decent-sized cooler was provided that we found very useful for keeping extra beer on ice. 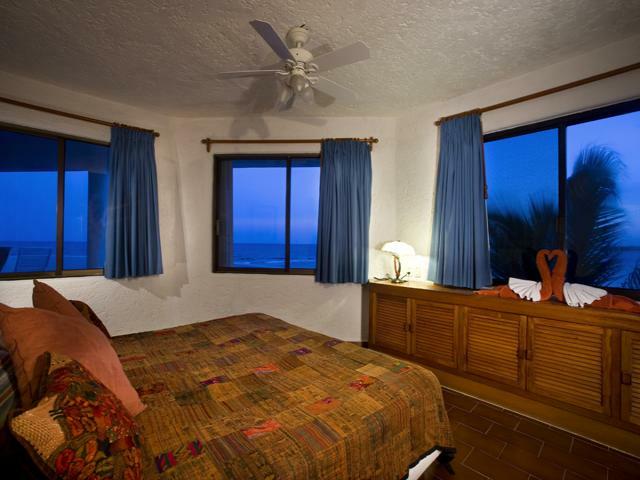 Location: we thought the location was fantastic, but it is relatively far from the shops and restaurants (other than Que Onda, which is a terrific place to eat); unless you’re a dedicated walker, consider renting a car, bikes or golf carts. We went with golf carts –there is covered parking and a plug available for charging – they worked perfectly for us. 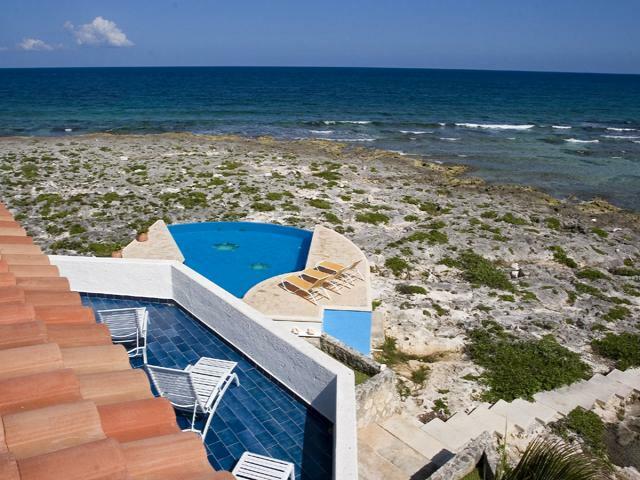 We rented through Akumal Villas and they were wonderful to work with. 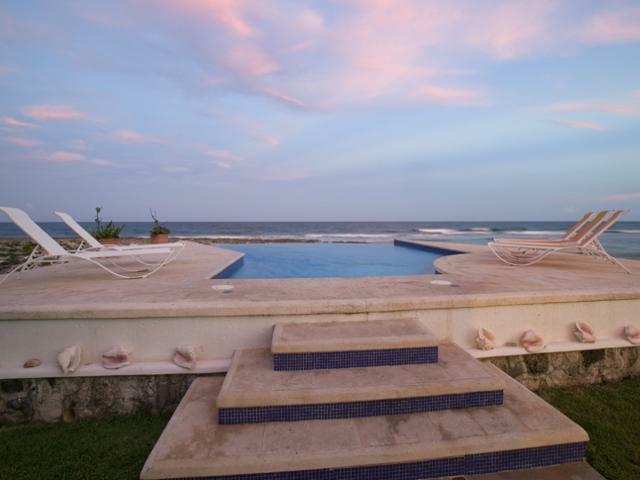 The villa booking process was easy and they were also very helpful with booking our airport transport and golf cart rentals for the week. They quickly responded to any questions we had prior to arrival and when one of the bedrooms had an issue with the hot water in their shower, a message to them was relayed to the owner who arranged for someone to come and fix it the next day. On a Sunday, no less – major kudos to all involved. I do want to echo what other reviewers have said about Jesus and Diameli, the caretakers. They were extremely pleasant and efficient in keeping everything clean and running -- it was almost magical the way fresh towels would appear just when we needed them, dishes washed, windows/blinds drawn or opened, etc – any time we needed anything, like another big bottle of water in the kitchen, Jesus got it done immediately. I regret that we never worked out a date to have them cook for us – we’ll definitely plan better on our next visit. If I have one suggestion to make – not really a criticism, more of a suggestion – there could be more outside seating for a group of 8 people. The pool loungers were fine – the older ones perhaps less comfortable than the newer ones – but they’re not ideal for sitting and socializing. Sometimes we all just wanted to sit outside to chat and enjoy the view and it would turn into a subtle game of musical chairs. We could have used more regular chairs -- the stackable resin ones would be just fine -- on both decks. Could also use more little plastic side tables for drinks. Overall, we had everything we needed and more. We’re already working on getting a group together to rent Nah-Hah again next year – can’t wait to go back! Logan, Barbara, Joe Georgina, Andre Susie. Jesus, Diane looked of us very well. The meal they prepared for us was extraordinary. This house has stunning viwes that amaze me every da. It was a treat staying here. Jesus did an amazing job cooking, Ana cleaning. Looking forward to staying here again. This house was everything I expected and more. Had a great time. Loved your place. WOW! What a great place to vacation. The host family is wonderful, very kind. We enjoyed our time to reconnect to the family as well to discover Mexico! We had great week. The house in the perfect location for the things we wanted to do. beautiful property with a great view, Jesus took great care of us and he and his wife cooked an amazing dinner for us on the last night here. Thanks for letting us stay.